Following our recent (20/2/18) posting “Where is Option 3 for the Elsternwick Urban Renewal Area?”, GERA was contacted by Council. Councillors had been advised by the Planning Officers that Option 3 did not exist and that Council was receiving numerous emails, asking for Option 3, which Council was unable to respond to as there was nothing to provide. It appears semantics have entered the picture – various alternate terms (eg. Iteration 3, Version 3, Agenda Item, not one or the other) have been used by Council when communicating with residents requesting updated EURA information. On the other hand, the residents have retained the terminology (ie. 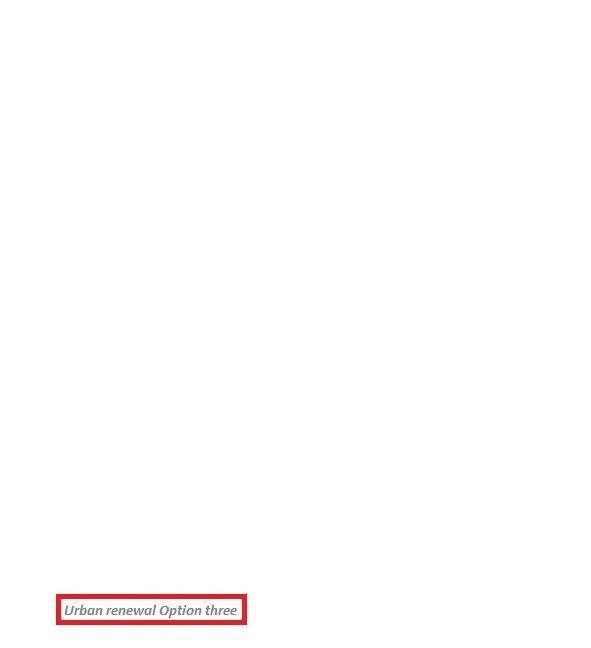 option) included in the Draft Structure Plan for Elsternwick. If Council should defer making a decision on Tuesday to give residents time to review and provide feedback (for all three centres) on the deluge of information provided. Below are the schematics of Elsternwick Urban Renewal Area which, if available, would have appeared in our previous posting as Option 3. We also advise that a change.org petition, opposing high-rise development in Elsternwick, has been initiated by the residents. Feel free to read and sign if you wish. Council has just published the Agenda for Tuesday’s (27/02) Council Meeting. Included in the Agenda Items are Updated Structure Plans for Bentleigh, Carnegie and Elsternwick and also the Quality Design Guidelines which apply to these and future activity centre Structure Plans. Although we have yet to review these documents in detail (look for subsequent posts), their publication represents a major milestone towards completion of the Structure Planning exercise ordered by the Planning Minister. Based on GERA’s involvement in this exercise, we urge all residents to review and assess these documents as we believe the planning outcomes (eg. expanded boundaries, height increase, rezonings, urban renewal areas and strategic sites etc.) for these 3 centres are likely to flow down to the Glen Eira’s emerging major activity centres and lesser activity centers. We also encourage residents to attend the Council Meeting (if unable to attend, view the meeting via Live Streaming). WHERE IS OPTION 3 FOR THE ELSTERNWICK URBAN RENEWAL AREA? 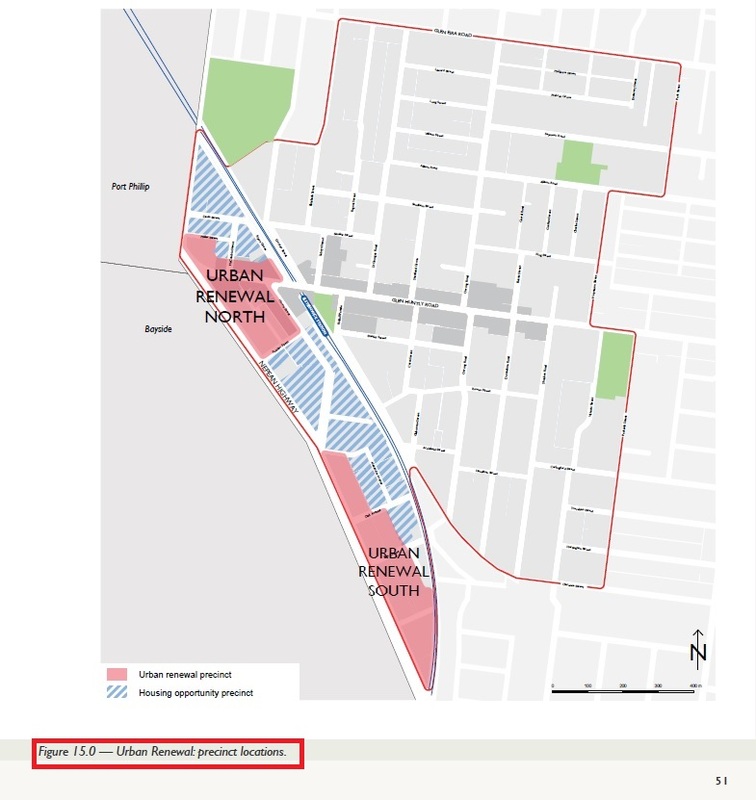 Posted on February 20, 2018 | Comments Off on WHERE IS OPTION 3 FOR THE ELSTERNWICK URBAN RENEWAL AREA? 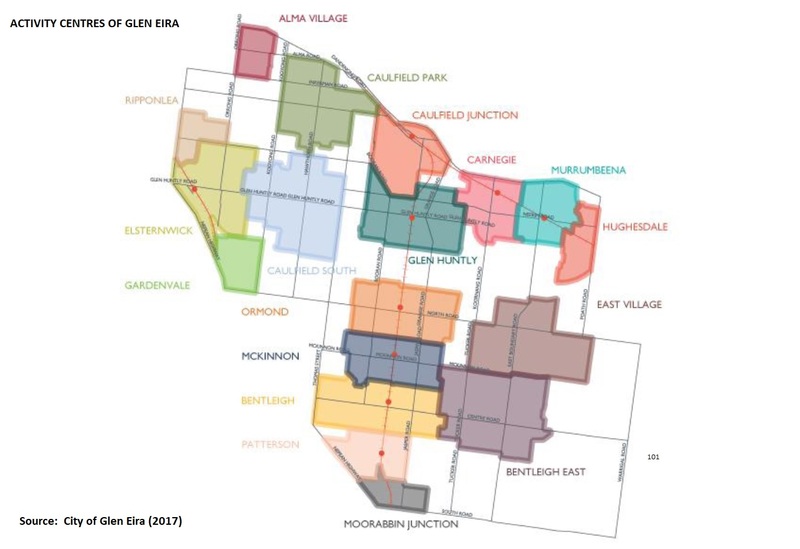 GERA has been advised that Glen Eira Council has now developed and completed a third plan (Option 3) for the Elsternwick Urban Renewal Area. lacks any response to basic questions re retention of neighbourhood character or heritage, overshadowing, privacy, traffic management and parking provisions etc. Options 1 (the original proposal) and 2 (prepared to address the concerns raised re Option 1) have been resoundingly criticised by residents (see above), hence option 3 was prepared. Option 3 has yet to be released for residents review, residents requests for its early release have been denied. Option 3 details are scheduled for release at noon on Friday (23/2/2018), as part of the Agenda papers for Tuesday’s (27/2/2018) Council Meeting where it will be voted on by Council. Apparently Council has decided that, if Council’s Planning Officers are unable to achieve community consensus after two consultations (with limited Councillor attendance), it is considered acceptable not to present a 3rd option (or any 3rd option details) to the community any earlier than Council’s self mandated ruling of 4.5 days prior to a scheduled Council decision (which in this case is Option 3). is not only inadequate but also contrary to the principles of open, transparent and representative government. Principles which Council statements acknowledge and actively promote. 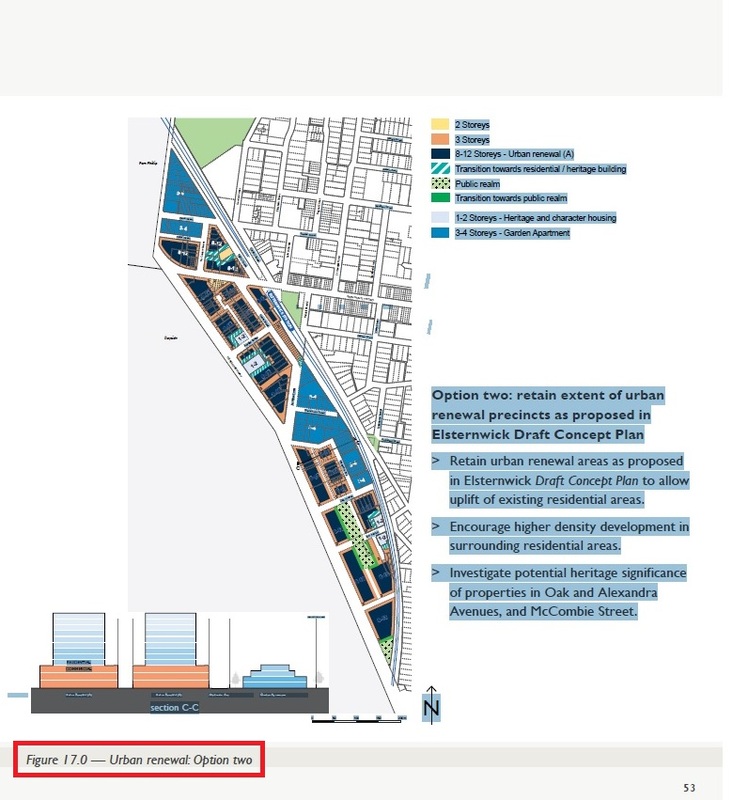 Given Council’s acknowledged poor consultative performance on the Elsternwick Urban Renewal Area, residents are simply not “buying” into comments that adequate consultation has occurred or that Option 3 addresses the residents’ concerns. As they are the ones who have to live with the outcome of Council’s decision, they are demanding the opportunity to review and have their say. It is their right. The Elsternwick residents and GERA urges residents to email all Councillors and key Council Officers A.S.A.P. Don’t forget to add your name, street address and telephone contact no. “I ask that Council defer it’s decision on Elsternwick’s Urban Renewal Zone Option 3 until community consultation has occurred”. We know it’s a royal pain in the proverbial to be constantly emailing Councillors and Officers (if you can only send one email – send it to the Mayor). However, it is important and is necessary to ensure due consideration is given to resident input into Council’s current and future decision making processes. 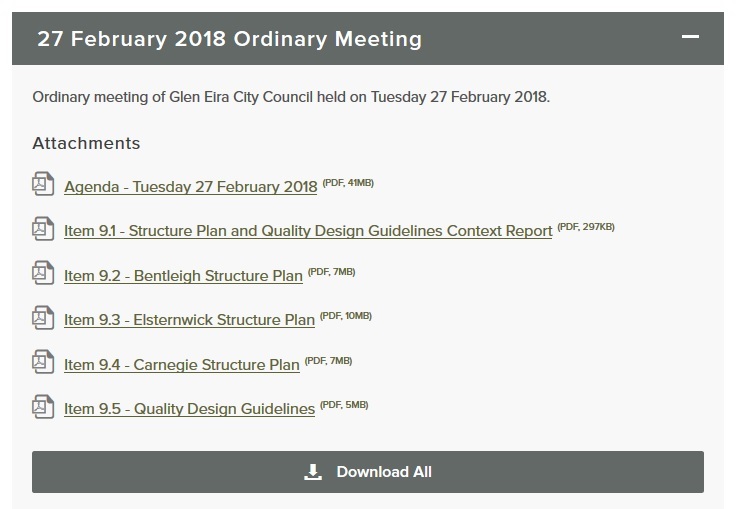 Both GERA and Council encourage resident attendance at the Council Meeting (7.30 p.m. Tuesday, 20th February, 2018 at the Glen Eira Town Hall). As always feel free to comment on this posting via GERA’s facebook page. 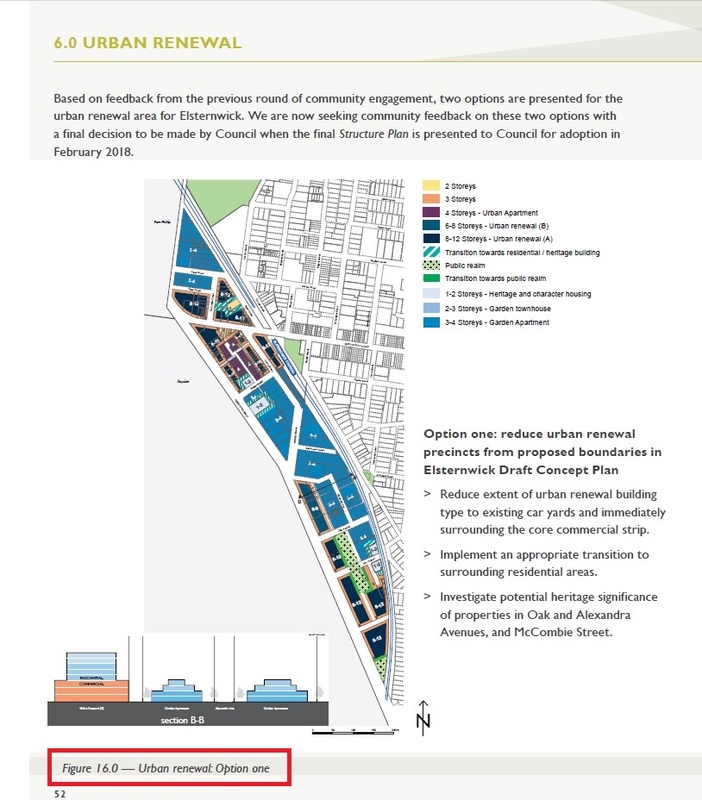 Comments Off on WHERE IS OPTION 3 FOR THE ELSTERNWICK URBAN RENEWAL AREA? We have received the below email from the Elsternwick Group opposing the Draft Structure Plans for that Activity Centre. It reminds residents that submissions are due tomorrow (11/12) and includes a sample submission that residents may use when preparing their submission. Submissions for the Bentleigh and Carnegie Draft Structure Plans are also due tomorrow. Residents preparing submissions for any activity centre, should also review our earlier posting re an Open Letter to the Mayor . You may wish to include some of the issues raised in your submission. A reminder to respond to the Glen Eira council using ALL feedback channels available – please help us make this final push to be heard! Residential areas reduced from 4 to 3 stories (and further reduction of apartment block zoning to townhouses). Forward to other Elsternwick residents you know!! Clearly state you reject both options in the Elsternwick Concept Plan. Plan is excessive and completely out of character with the suburb and the reason people (choose to live here). 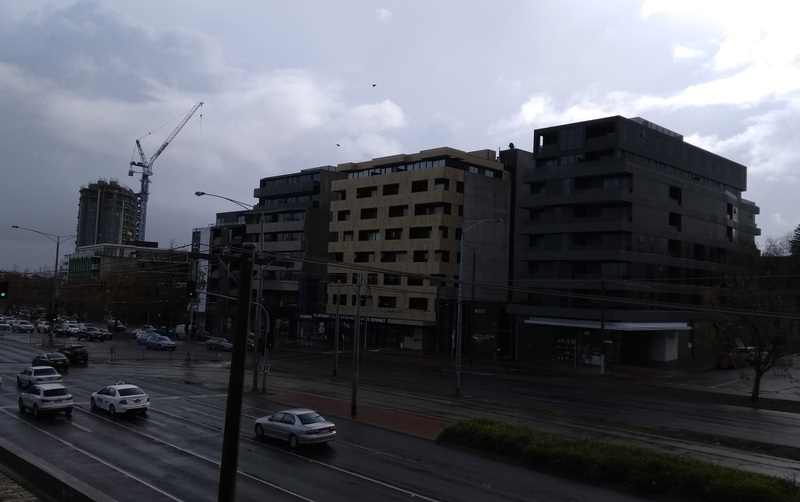 Council has provided no detail (or addressed community concerns) around how properties next to or near 12 storey developments will be protected by MASSIVE overshadowing and privacy concerns in a residential area with many young families that have children. City Futures and Mary Delahunty said a traffic impact assessment was being done during Stage 5 of consultation. Council has not released the outcome of this impact assessment or been able to answer simple questions around how a significant increase in traffic (given the 20%+ increase in residents in this small area) will be managed and how traffic will be managed in the small residential streets leading up to the Elsternwick shopping strip with likely traffic chaos in St James Pde (which has a school), Denver Ave, Collage St, Horne St/Glen Huntly Road intersections. Additional impacts to our already over-crowded train, tram and bus facilities – plans have NO detail on how this is being managed. Both options destroy heritage/character properties in one of the oldest parts of Elsternwick (many of which are circa 1880 and turn of the century Edwardian properties). It is letting developers destroy Elsternwick history. Council has provided NO detail (or addressed community concerns) around car parking in the urban development zone and in the shopping strip to cater for a significant increase in residents many of whom will still need to drive to local shops. High rise development is at direct odds with the objective of creating and protecting Elsternwick’s character and “village feel” changing the social fabric of our suburb. New public space in urban development zone is only being ‘advocated’ for – there is no detail around how the council will secure this park space. Council has stated it is taking a whole of municipality approach to meeting Victorian government housing targets – why is it not providing a consolidated list of all housing development sites/opportunities across the municipality? 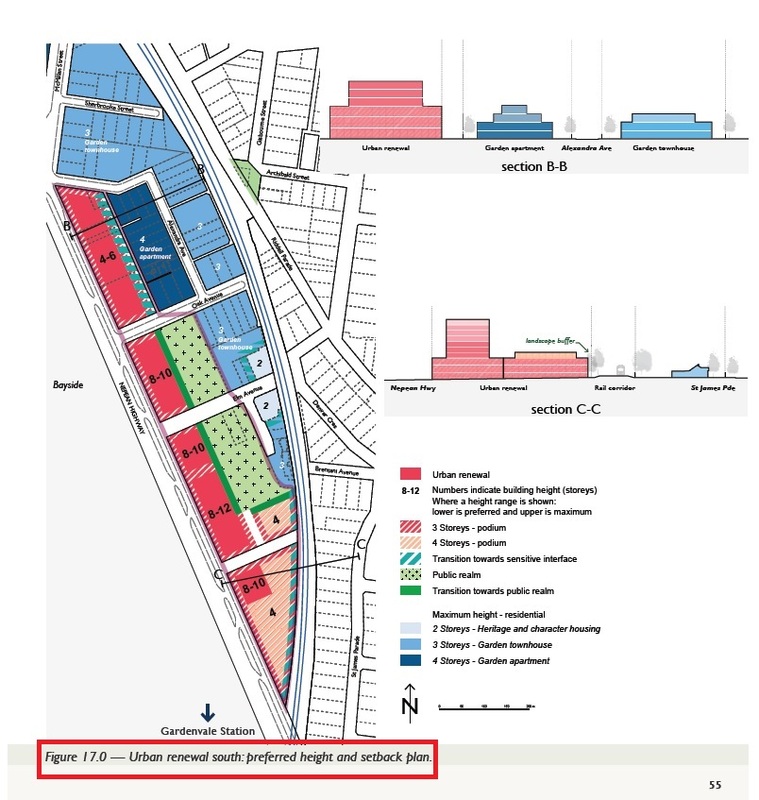 Across the municipality, council has enough opportunities to meet these targets (and is already meeting and exceeding its targets) without creating such excessive highrise building zones in Elsternwick. 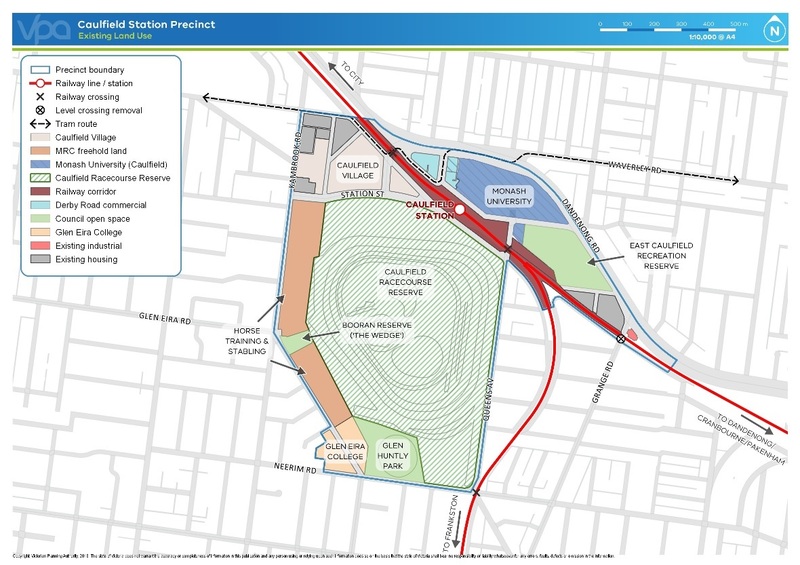 This includes 24 hectares in the new East Village; significant opportunities in Bentleigh and Carnegie (including the Bentleigh car yard area which has THREE railway stations close by) and a recent petition from residents to develop the area on Glen Huntley Road near Hawthorn road. 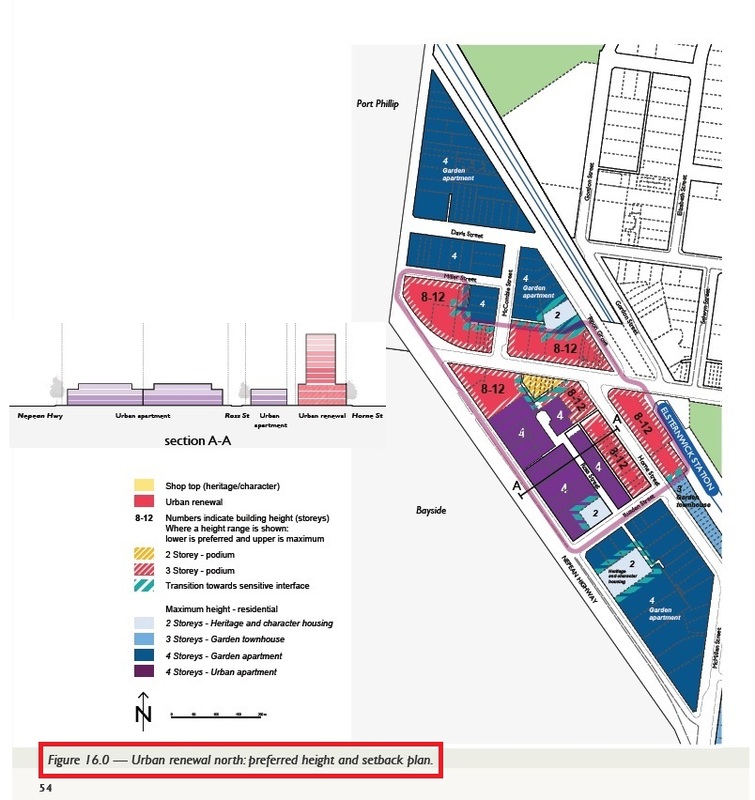 In addition, there is already a clear precedent for higher rise developments in the Glen Huntly Road shopping strip -which is actually in the Activity Centre zone. We EXPECT our elected representatives to come up with a more appropriate and balanced option that protects Elsternwick’s heritage, character and village feel (across the entire suburb).Don’t turn our municipality into another Port Melbourne / Docklands disaster!